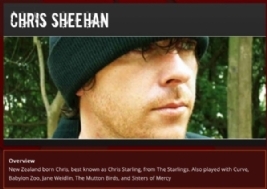 Very sad news has come our way today about Chris Sheehan, who allowed two of his songs to be played on the STYH podcast in July of 2013. It was around that time that Chris revealed he was suffering from terminal cancer. Despite that, Chris continued recording music with the help of crowdfunding, with the intention of releasing everything he recorded free of charge. "I can't justify any of my limited income to be spent on my own non-profit activities. Stage 4 metastatic nodular melanoma. Clinical trials and palliative treatment only. Wife terminally ill. Dozens of rescue animals. I don't own a computer anymore and would like a good laptop and software to see what comes out. I will not divert money from my family for selfish artistic urges. Maybe someone who enjoyed a starlings record at sometime is flush. The closest I've been is flushed. Anyway if no one helps I'm off the hook so nothing to lose. Ta Chris". "Hi, photo is just to show its true. There's more on my back. I'm one of the 'living with' not 'dying of' cancer group. I have never asked a doc 'how long?' If you help thanks you will get links to any finished music. The music will be available as free mp3s regardless. Napster killed expense accounts...good job!" Chris sadly passed away in December. RIP Chris, it was great to meet you at Band On The Wall in Manchester.